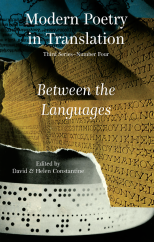 ‘Between the Languages’ focuses on poets who, by choice or by force of circumstances, move among the languages. Must a poet write in the mother tongue? Will a second language serve just as well? We look at poets who translate themselves. Others who might but won’t. Others who defend their mother tongues by refusing all translation. Highlights include the poetry of Dimitris Tsaloumas, who moves between Melbourne and Leros, and Itzik Manger (1901-69) who wrote in Yiddish in his wanderings across the world. This volume of MPT asks questions about language and identity. Also includes poems by Brecht on exile. A poem from ‘Between the Languages’ was the Guardian Saturday poem on Saturday December 31st, 2005 and can be read here.